Researchers at ANU recently proved a novel method for generating orbital angular momentum states (vortices), with a topological charge that is ensured by an exceptional point. Recent studies at the ANU resolve an outstanding problem in exciton-polariton physics, and open exciting future research directions in the field. The work by the former ANU postdoctoral researcher Tingge Gao and FLEET researchers Guangyao Li, Eli Estrecho and Elena Ostrovskaya, together with collaborators at the ANU and internationally, resulted in observatioin of the exciton-polariton wave function at a special point in the space of parameters that is known as an 'exceptional point' (EP). The EP exhibits an inherent chirality or 'handedness' which the researchers employed to robustly generate vortices in an exciton-polariton quantum fluid. Exceptional points arise when resonances coincide in a system with gain and loss resulting in merging of the corresponding wave functions. As the name suggests, an EP features counterintuitive behaviour and is a focus of recent intense research in classical systems such as optics, microwaves, plasmonics, acoustics, and optomechanics. Because of the nontrivial topology of the EP, the merging of the wave functions results in a well-defined 'handedness' (chirality). However, this chirality had not previously been demonstrated in any quantum system. The ANU study was the first demonstration of such a chiral state at an EP in a macroscopic quantum system of condensed exciton–polaritons. Exciton–polaritons are hybrid particles that are part-matter and part-light, bound together by strong coupling within semiconductor microcavities, where they can form a Bose-Einstein condensate. Importantly, the existence of EPs and the associated topological phase in exciton-polaritons was first demonstrated by the ANU group in 2015. This result paved the way to further studies of 'non-Hermitian' quantum physics of exciton-polaritons, which may uncover novel operating principles for polariton-based devices. In the polariton-BEC lab at ANU, researchers generated vortex flows with fixed handedness (chirality) in exciton-polariton quantum fluids by carefully tuning the the shape of the resonator induced by light. Previous work from the same group already showed vortex generation, using the chiral shape of the potential landscape. In this new work, the chirality arises from the topology of the EP rather than from the light-induced potential. This was achieved by driving two resonances corresponding to non-chiral dipole (two-lobed) modes towards each other. Near an EP, the interference of these modes resulted in a chiral state, which is a vortex flow. The work demonstrates a new method for generating orbital angular momentum states with a topological charge that is protected by the nontrivial topology of the EP. The research was led by former ANU postdoctoral researcher Tingge Gao. Chirality of a mode at an EP is a fundamental property of systems with gain and loss (known as non-Hermitian systems) and has been previously demonstrated in classical waves (in particular in microwave and optical systems). The ANU work marks the first observation of this kind in a quantum system. The work opens up an exciting future research direction in exciton-polariton physics: the exploitation of nontrivial properties of EPs within a quantum system could lead to even more interesting advances such as enhanced sensing and topological switching, which so far have been demonstrated only in classical systems. Furthermore, the work encourages future experimental studies of non-Hermitian physics including EP clustering and creation of higher-order EPs in a macroscopic quantum system. 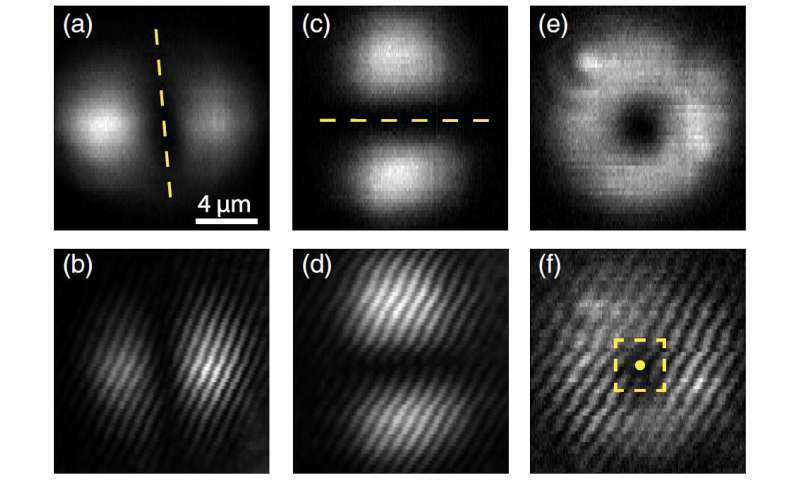 The study Chiral modes at exceptional points in exciton-polariton quantum fluids was published in Physical Review Letters in February 2018.